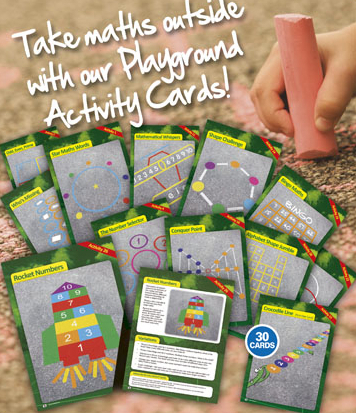 Make maths teaching outside the classroom meaningful and stimulating, with this challenging set of 30 playground activities. Devised, tried and tested by our maths expert Steve Humble (aka Dr Maths), children will be actively engaged by these games, contributing positively to the depth of their learning. Each activity can be simply drawn on the playground with chalk. Which means they can be removed or changed easily, especially useful if space is limited, or variety is needed. The activities can be used throughout KS1 and KS2 – we’ve included suggestions on how to make the tasks easier or harder. Used with either small groups or the whole class, they provide opportunities for problem solving and discussion around key concepts such as number, shape and space, measures, and data handling. Easy to follow activity cards enabling non teaching staff, pupils or teachers to create the activity, with suggested variations so the activities can be extended or differentiated; making them suitable for specialist and non speacialist teachers. Set contains 30 double-sided, A4 Cards.